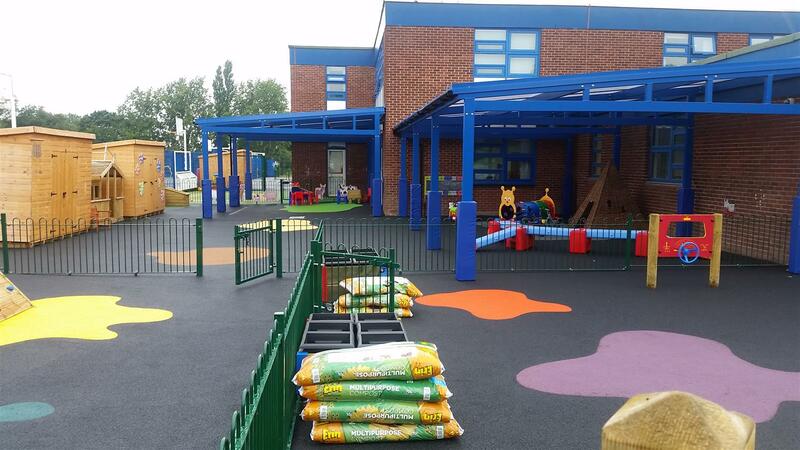 Before Green Lane’s playground development, we worked on a huge installation at their sister school - Fox Wood. 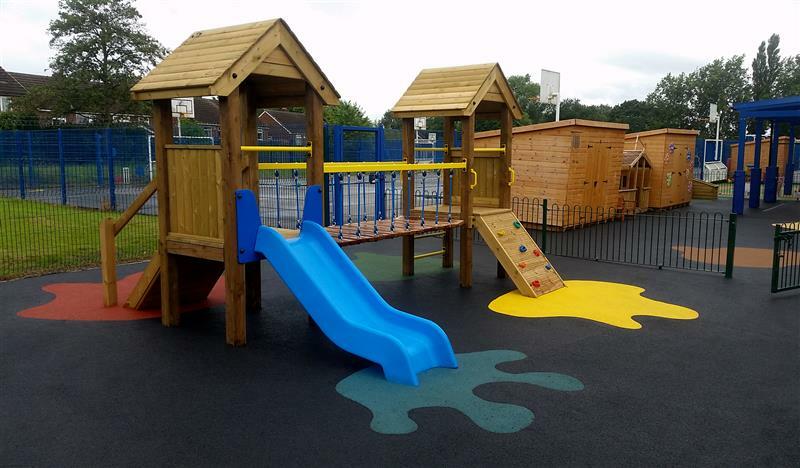 After seeing how our development had transformed the lives of Fox Wood’s children, Green lane decided to contact us for a new playground of their own. 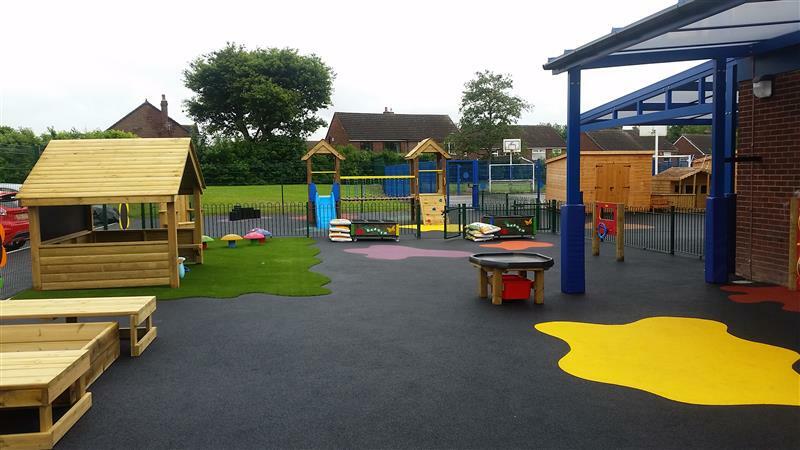 Before Green Lane became a school for children with special educational needs, it was a secondary school and because of this, their playground surface was barren and hard because of the large amount of tarmac used in their outdoor environment. 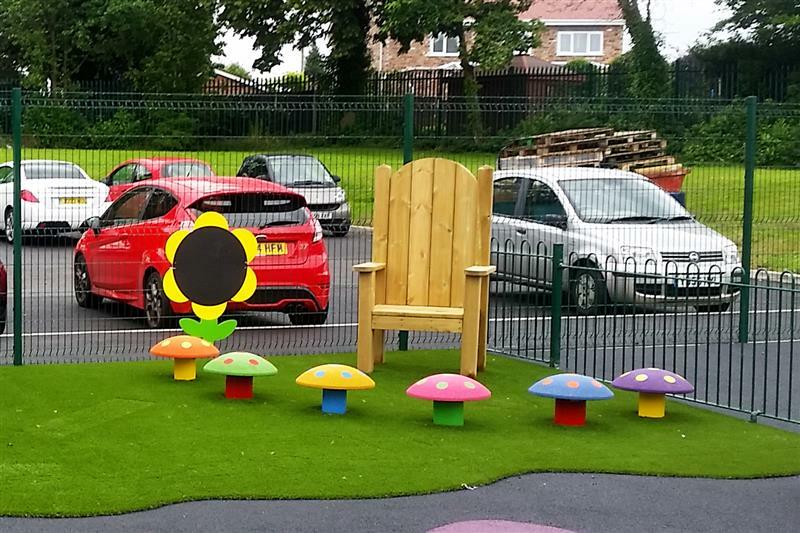 The hard tarmac was a problem as Green Lane’s early year’s and autistic children needed a soft safe surface to play on to ensure accidents were kept to a minimum. As their inspiration came from our project at Fox Wood, to be unique to the school, we agreed that Green Lane’s space would be developed differently and include less fixed resources. This would allow more opportunities for the children to play interactively and as part of a classroom through the freedom it would bring. To follow this theme, many of the resources installed, have multiple routes to play and learning that can be changed and manipulated to best fit each type of need a child may have. It also allows children to create their own games and activities with other children; our Playhouse is a perfect example of this as it is an open-ended resource that enables children to create their own imaginative worlds and can be used by teachers to theme the children’s play. 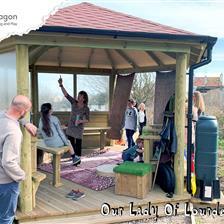 Green Lane wanted to create an outdoor learning environment that would feel like an extension of the classroom. 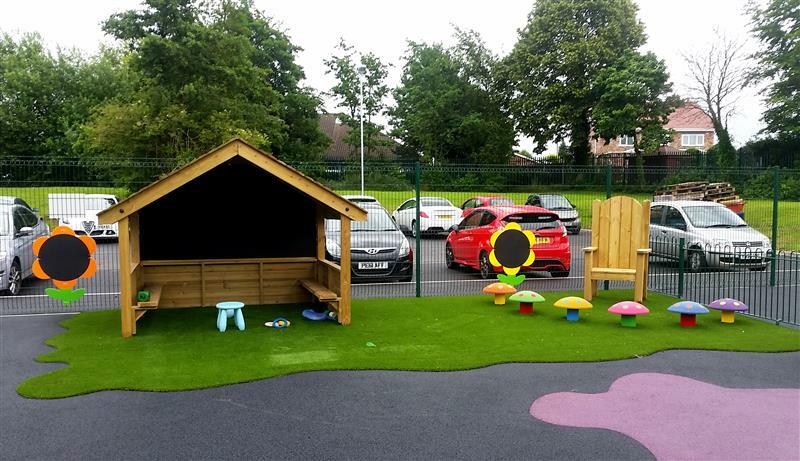 This would help children adapt more easily to their outdoor environment as well as feeling comfortable to express themselves and get the most positive play time they can get while at school. 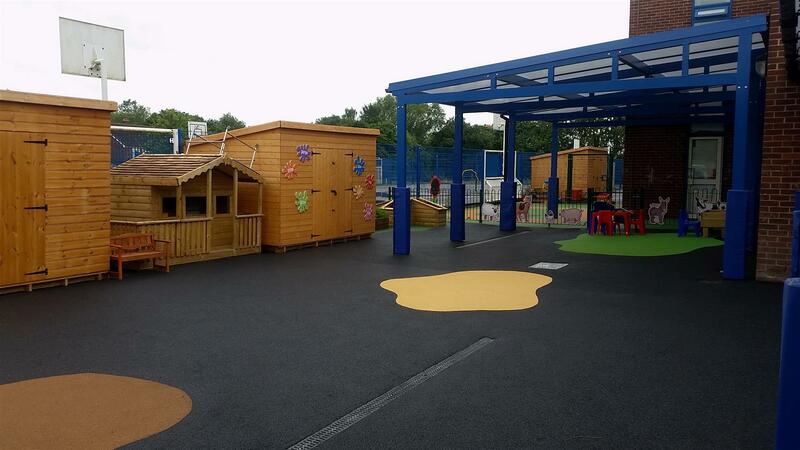 Some special needs children may feel frustrated if constantly indoors with less space to manoeuvre, so ensuring the school had a smooth connection from the classroom to the outdoors was vital. Our Twin Tower Unit was installed because the children needed a structure to release their energy, de-stress and experience multiple physical challenges. The Tower includes climbing ramp and a ladder climb which will develop children’s upper body and core strength. As the school wanted to implement managed risk, the varying difficulty of each active challenge will entice children to take safe risks according to their ability. This will not only improve their confidence but also enhance their overall wellbeing when at school. The Tower’s structure naturally lends itself to imaginative play with den-making opportunities under the suspension bridge and areas designed for pretend play - who will be the King/Queen of Green Lane Castle? Wetpour safety surfacing was used around the Tower to reduce the likelihood of incidents and also further inspire the creative opportunities with the inclusion of paint splashes prominent at the main entry points… let’s slide down into the water! To bring music to Green Lane’s playground, we installed our African Drums as they are one of our most popular Musical Play Resources. Children will be given the freedom to express themselves through the colourful inspiration that the drums brings and have the opportunity to make music and sounds with up to 4 other friends. Music and friendships will thrive as they learn about the different sounds of beats and noises together. 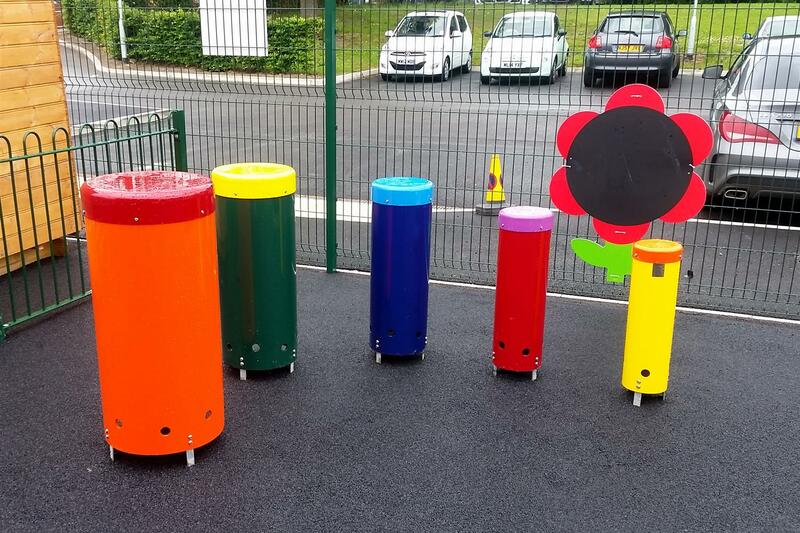 The 5 drums vary in height so that they are accessible for each and every child at Green Lane. Creative and Imaginative Play brings endless benefits to special needs children as it adds a new dimension to learning and engages their minds. We created a fantastic corner full of creative resources! 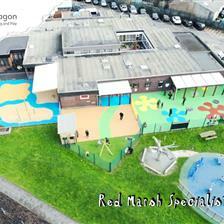 To zone the area from the rest of the playground and give it a bright natural feel, we installed our Playturf Surfacing. 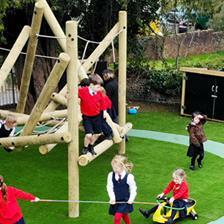 This ensure that when children stepped onto the artificial grass turf, they were entering their creative corner. 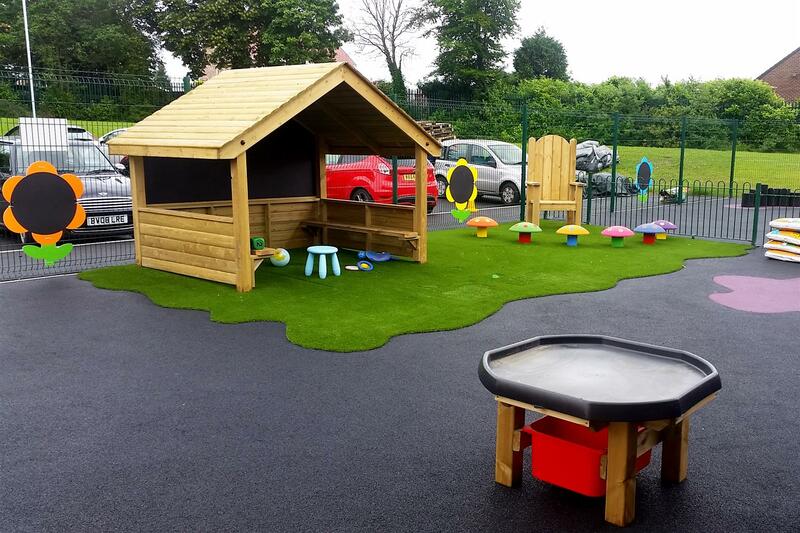 The natural grass feel will also bring sensory stimulation as the children brush their hands through the grass and sit together when learning. The creative corner has its very own Story Telling Circle with Mushroom Seating which means teachers can gather children round to create magical story telling sessions and with the nearby inclusion of our Playhouse, the children have their own mini house (or whatever they transform it into) to act out the stories being told. The Story Telling corner can also be utilised to create a quiet area where children can sit with friends or privately with staff to talk about their day or complete given tasks. As mentioned, the creative corner was made complete with our Giant Playhouse with Chalkboard and Seating which is the ideal open-ended inspiration for the children to take part in role and pretend play. With the addition if the chalkboard and seating, it allows the children to decide what they use the playhouse for e.g. Doctors, Vets, School, Play Den, Airport and much more… It also doubles up as a great teaching aid; children will love to be taught in their ‘outdoor classroom’ as being outside in the fresh air will help to calm and focus them on what is being taught. Sensory-rich experiences are vital for developing connections to the brain which is why sensory play equipment had to be included as special needs children need this experience in their play. Our Small Covered Sand Box was included as it promotes exploration through messy play and will develop children’s sense of touch and their muscle/ligament movement. The design lends itself to group activities and children will love pretend playing together when digging for gold or searching for rare dinosaur bones. We also added a couple of our Tuff Spot Tables for additional messy play opportunities. Watch as children stand around the table together and manipulate different materials from play doh to flour. With storage underneath, the children’s favourite toys and materials can be stored to be used whenever messy play or art activities take place. For Natural Play, we included our Cruciform planter that will give the children further sensory sensations through the manipulation of soil. Teachers can now teach the children about planting and introduce scientific topics in an outdoor environment. Children will be fascinated as the plants begin to develop and grow out of the soil. We added our Large Driving Panel to provide another resource that would spark creative ideas and one that could be utilised by a large number of children. It also gets the children introduced to an important aspect of the future, as well as getting them to feel like a ‘grown up’. They will come up with a number of imaginative activities that will see them and their friends driving around the playground, searching for treasure as they sail the seven sea’s or even taking it in turns to drive to a new play activity around the playground. Everyone loves seeing themselves distorted through the curves of our Wobbly Mirror. This is a fun piece of equipment that will put your children into fits of giggles with their friends. This is a fantastic resource for pretend play and interacting with others. Our Playground Equipment can be bespoken and tailored to specifically challenge and develop children with special education needs and we’re able to create outdoor learning environments that cater for a wide-range of abilities. The Pentagon Team is not only made up of outdoor learning professionals but also specialist SEN consultants. If you have an area that you want developing, do not hesitate in contacting us on the chosen number - 01625 890 330 (North Office), 0117 379 0899 (Southern Office) or Contact Us through our website to speak to one of our consultants.